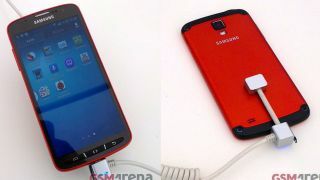 So does this look better or worse than the S4? Just hours after benchmark results supposedly revealed some of the specifications for the Samsung Galaxy S4 Active, images have appeared online claiming to show the rugged handset in all its glory. The shots were picked up by GSMArena via a tipster, and the smartphone in question is said to be the dust- and water-proof Samsung Galaxy S4 variant. While the Galaxy S4 Active appears to keep the rough form factor of its brother, there are some notable discrepancies - the first of which is that Ferrari red finish which will certainly make it stand out from the crowd. There's a more industrial look to the handset with four large rivets in each corner on the back of the device, and there's clearly a plastic flap to cover the charging port at the base of the S4 Active to keep out that pesky water. Move round the front and you'll find Samsung has employed three chunky buttons which appear to be made out of rubber and while they'll work in the rain, unlike their touch counterparts, they do make the phone look a little toyish. Buttons aside, if this is the real deal - and to be fair it looks pretty likely - the Samsung Galaxy S4 Active is set to be a relatively attractive smartphone. Details which accompanied the photos suggest it will sport a 1.9GHz quad-core processor, 5-inch full HD display and an 8MP rear camera - a downgrade from the 13MP option on the S4. According to the tipster the Galaxy S4 Active has already been showcased in Croatia, but we're still awaiting an official announcement from Samsung.